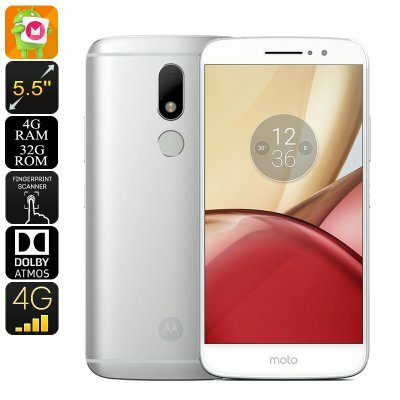 Successfully Added Lenovo Moto M Android Phone - Android 6.0, Daul 4G SIM, Octa Core CPU, 4GB RAM, FHD Display, 13Mp Camera (Silver) to your Shopping Cart. A mid-range phone with some great specs and fantastic build quality, the Lenovo Moto M Smartphone offers great value for money. A full metal body design gives the phone an impressive look and at just under 8mm thick this slim smartphone fits comfortably in the hand. The Moto M has a fairly stock Android 6.0 Marshmallow OS that is simply a joy to use and responds magnificently. The Phone has a Dolby Atmos powered speaker that makes the audio a delight to the ears. 4G connectivity and two nano SIM slots (one doubles as the micro SD slot) bring fast network speeds so you can download and stream HD content without any lag. as well as 4G the phone has Wi-Fi 802.11 a/b/g/n , Bluetooth 4.1 GPS and A-GPS as well as a USB type C port that offers faster charging and data transfer. On the rear of the phone is a 16MP camera with an f/2.0 aperture, dual tone flash and phase detect AF so you can snap some stunning photos day or night, you'll also be able to record full HD video as well. A rear fingerprint scanner brings proper security for your files and means you'll have one less password to remember. Housing a 3050mAh battery the Moto M Phone has good usage times and a single charge should see you right through the day. The Lenovo Moto M comes with a 12 months warranty, brought to you by the leader in electronic devices as well as wholesale Android phones and cell phone gadgets..